Gorgeous Goa, although India’s smallest state, has a big reputation. 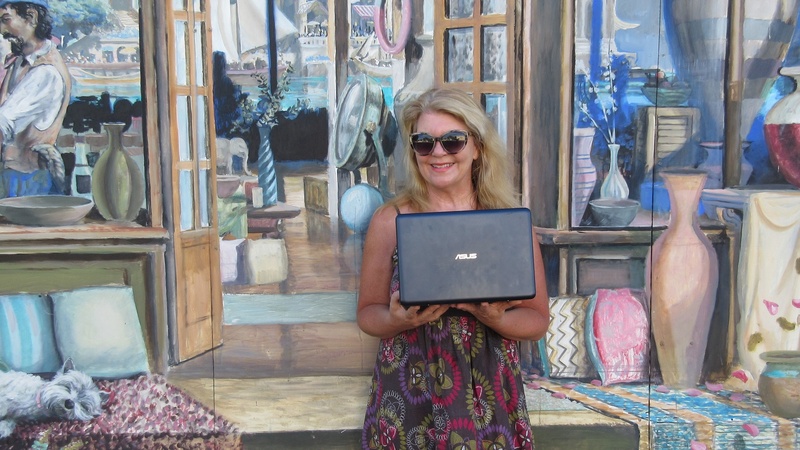 People go there for fun as well as relaxation, and beach life can be more like a continuous performance of colourful street theatre than a getaway from it all experience. I love Goa, its colours and its energy, its people and its food, but I had never been to the rather less hectic beach of Ashvem in North Goa. We pulled up at Yab Yum eco resort which is set right on this stunning beach. Our destination was shrouded in a palm grove plantation with planted areas, sandy pathways and the occasional giant bamboo. It really did feel like you were in your own little environment away from the rest of the world. Sheltered by the sand dunes you are seconds from the warm Arabian sea. 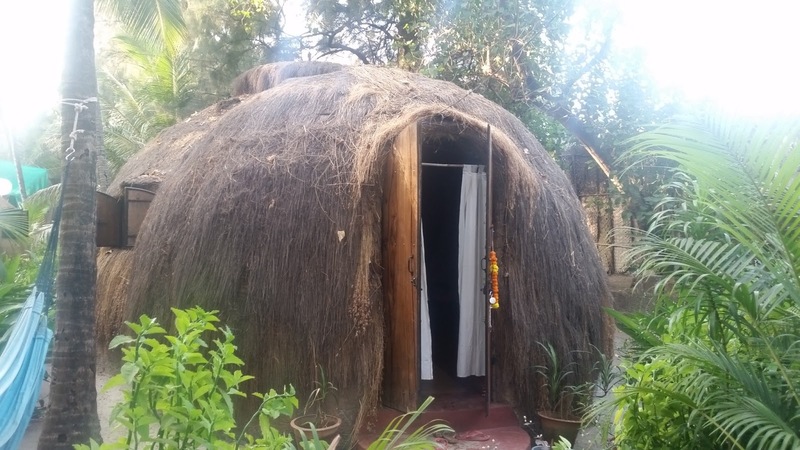 Accommodation is in local style cottages or in pods made of palm fronds. The super cute domes look like large igloos – but without the snow obviously – or houses for an over sized hobbit. We had a huge dome with small windows so things didn’t get too hot from the sun, a lazy fan whirring around and beds shrouded in gauzy mosquito nets which always look rather romantic I think. 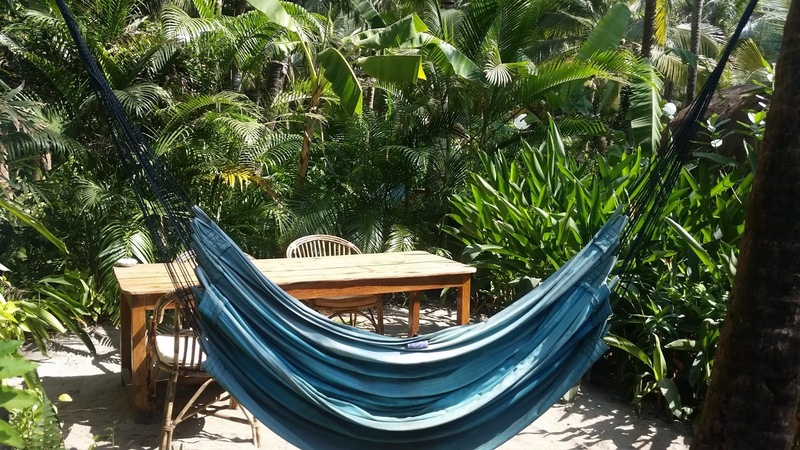 There were a couple of hammocks stretched between the trees outside and a small table where our delicious breakfast was served every morning. I was particularly taken with the home made marmalade and the beautiful fresh fruit platter which, served al fresco in the sunshine with a copy of the Hindu times and a cafetiere, is a most acceptable way to start one’s day. 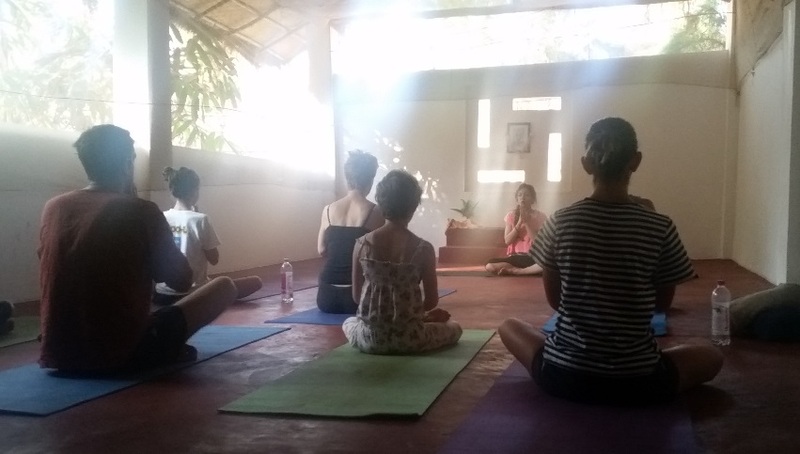 Yoga is big in Goa and you can join the morning yoga class here with Christina if you fancy a Down Dog first thing. Recently there was a hug mass yoga event on the beach here at Ashvem and staying at Yab Yum is quite a Zen experience. 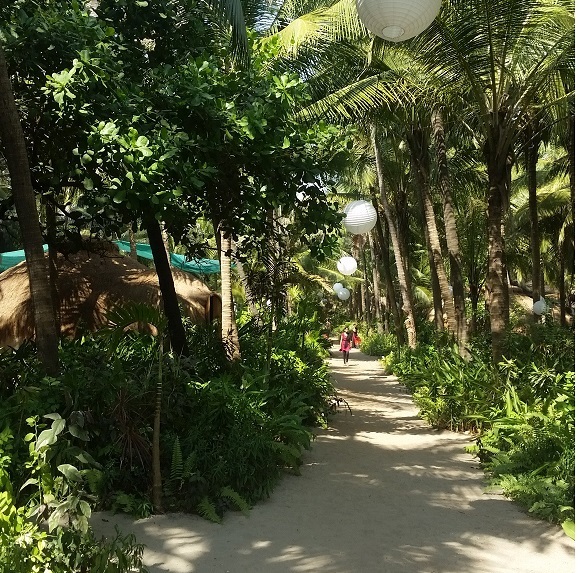 There is a lovely beach shack as part of the resort which serves delicious food or you could stroll along the beach or pop in to the village and sample alternative cuisine. If you really feel the need to. The beach here is delightful and not too crowded especially at the Yab Yum section. Lying on a padded sunbed with Sam serving you some delicious Masala Chai while contemplating a dip in the Arabian sea is pretty hard to beat as a holiday activity. I did try boogie boarding for the first time in the waves which are frisky enough for surfing and boarding but not too strong. I’m pretty wimpy when it comes to getting my face wet and I did practise the tamest style of boogie boarding ever, but I absolutely loved it and you can borrow the boards for free if you are staying here. We were approached by the beach girls selling clothes and jewellery and pedicures, but to be honest I found them quite charming and not a pest at all. They came from Karnataka near Bangalore and have to work here for six months of the year away from their families and then go back and work in the rice paddies for the rest of the time. Shoba and Angelina were only fifteen and sixteen and had never been to school although they said they would very much have liked to go. Education to primary level is free in many states and is highly valued in India, but this was not the case where these girls were from. 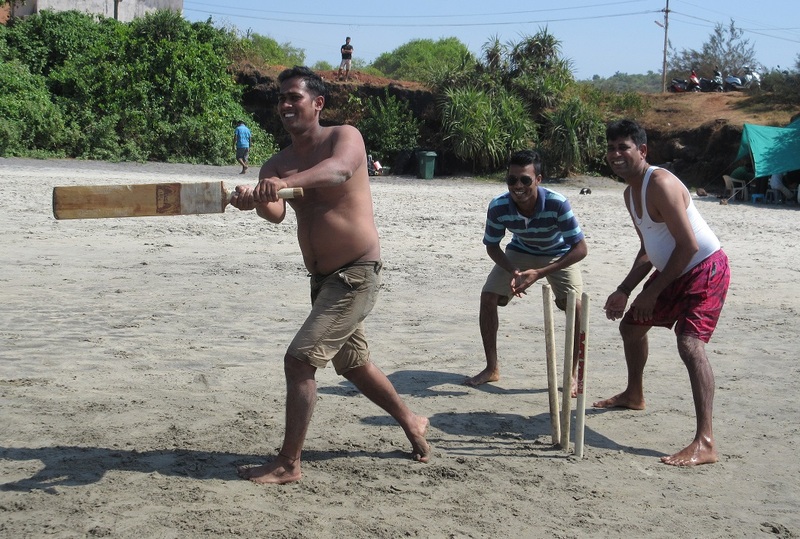 Shoba and Angelina report for work on Ashvem beach. Their English was still better than my Hindi however! Despite their hard working lives they had the biggest smiles that greeted you every morning. I ended up with an ankle bracelet, a pedicure, a manicure and a henna tattoo on my foot. I enjoyed hearing their stories and we put together goody bags of clothes and toiletries for them as we left. Yab Yum is an eclectic up market experience and you do feel that you are away from everything there. The resort grew organically from informally renting just one cottage for a holiday to acquiring the land lease from five different owners and it evolved into what it is now. 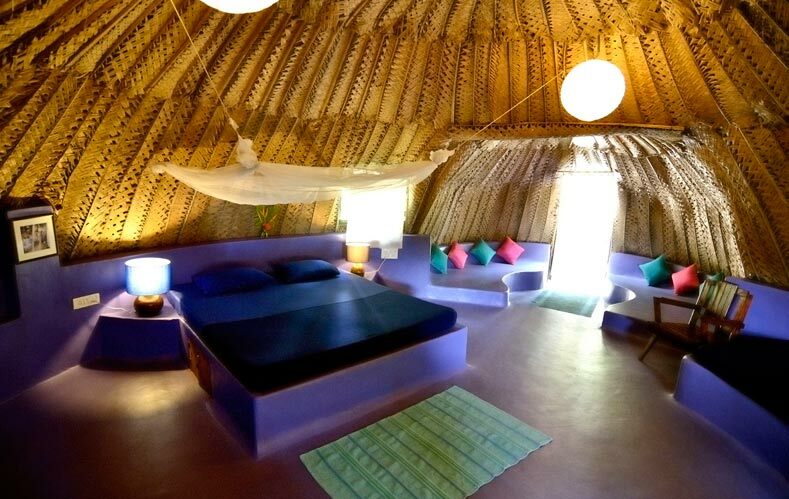 Yab Yum and other more unique accommodation in India can be booked through Tripzuki a new platform for accessing ‘India’s hippest boutique hotels’ – you might like to check it out.